On the day before the election, November 18, small rallies of a few hundred Saakashvili supporters each were reported in cities across Georgia. The crowd at Zugdidi swelled to thousands on Election Day as they prepared to mobilize, led by Misha himself under the plan to march halfway across the country and into his capital to claim the election victory. The march was delayed to allow more time to prepare, but the procession finally snaked its way along the rough route of the BTC line and arrived in Tbilisi like an invading army on the 20th. 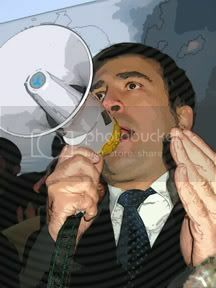 Otpor-trained Mikhail Saakashvili exhorts his followers in Tbilisi. Inside the chamber, the usurper Saakashvili declared dramatically “the velvet revolution has taken place in Georgia!” Meanwhile the President gathered with supporters in the cold outside the building telling them “I will only resign by constitutional means.” He declared a state of emergency amid what he called an attempted coup d'etat, and withdrew to the presidential palace where security had been beefed up. Opposition leader and Saakashvili ally Nino Burjanadze announced assumption of the presidency until things sorted themselves out. Later in the afternoon, Misha called Shevy and told him he could stay in office for a transitional period if he only agreed to early presidential elections. Twenty minutes later, a crowd stormed the palace, apparently a reminder that he had little choice. The whole thing had begun as a wrangle over parliamentary elections, but now a referendum on the presidency itself was forced onto the agenda. 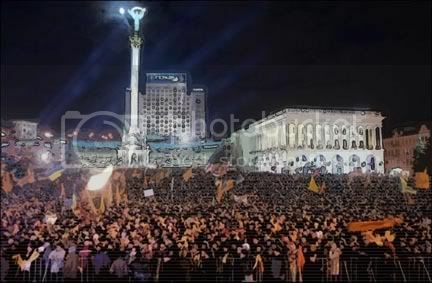 At the end of the day, what happened looked suspiciously like a CIA-sponsored coup of days past, this time simply masked by the popular uprising of the Rose Revolution and the coronation was to be by popular demand. 2004: Miles awarded the State Department's Robert C. Frasure Award for “peaceful conflict resolution.” 2005: ends his tenure as US ambassador in Tbilisi. March 2006: nominated Executive Director of the Open World Leadership Center, a Congressional body founded in 1999 to bring emerging economic, political, and cultural leaders from Russia, Ukraine, etc. to study in the US. The next day Shevardnadze bowed to the inevitable and turned the reins over to Burjanadze until Saakashvili could be confirmed by election. Russian Foreign Minister Igor Ivanov was present, having flown in the previous night to manage the Russian aspect of the crisis. After talking with the ousted president and sizing up the situation, Ivanov announced in an interview with Komsomolskaya Pravda newspaper “there are enough facts proving that what happened in those days wasn’t spontaneous, it didn't arise suddenly. Of course there were preparations and the U.S. ambassador was involved, as Shevardnadze himself admitted.”  Shevy was now more open about the forces behind his overthrow, pointing out to the media that Richard Miles, the U.S. ambassador in Yugoslavia and allegedly involved in organizing the overthrow of Milosevic, had been posted as ambassador to Georgia shortly before the roses were distributed. Abashidze’s self-imploding show of diehard support was too little too late to save Shevardnadze’s power. The ousted President was reportedly “stunned” by what he perceived as Washington's betrayal. “I was one of the staunchest supporters of the U.S. policy. When they needed help on Iraq, I gave it,” he lamented. “I don't have an explanation to what has happened here.”  Almost certainly the answer lies in his relationship with Russia. He’d been sent to Tbilisi in 1992 by Moscow, after all, and if he’d been allowed to observe the scale of the American offensive in the former Soviet space that soon unfurled, Moscow-Tblisi relations could well have thawed even to the melting point. But for whatever reason, he was taken out of the game first. He did not go into exile, though he was invited by the Germans, and remains free though in forced retirement in his homeland.